Our 7 Day Make Over Your Morning Mini Challenge is designed to give you a taste of our content and to help you to grow your list and inspire activity in your community. The posts or articles are a good mix of tips and ideas that will inspire your readers to work on increasing their courage and their self-confidence. There are inspirational posts and those with strategies that your reader can take action on right away. It's a good mix of content that your audience will enjoy. Since the articles also go up on your blog and can be shared via social media, this is a great way to grow your reach and attract new readers. This could be a free challenge to help you build your list and grow engagement with your readers, or it could be a paid product for a life or business coach. The content could also easily be turned into a 7 day group coaching program on making over your morning routines. 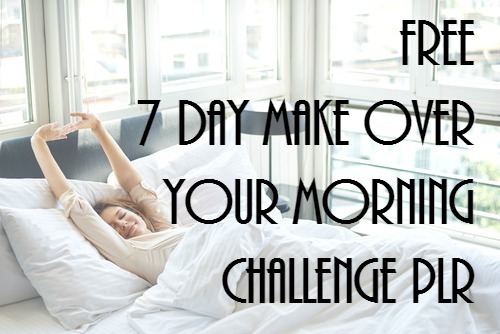 If you know how to copy and paste, you can set up this 7 day make over your morning routine challenge. Keep it free or make it a paid product. To recap, you’ll get the full 7 articles as a word document and txt files You’ll also receive 7 email messages to promote the blog posts. Get this 7 Day Make Over Your Morning Mini-Challenge PLR Bundle PLUS BONUS for FREE- and Start Growing Your List Today!